Director Peter Hyams is another one of my ‘go to guys’ when it comes to movies. I believe it started with ‘The Presidio’ which came out about the time I declared my love for stupid action movies and ‘The Presidio’ was certainly that. ‘Narrow Margin’ was a great thriller, ‘The Relic’ was damn good monster movie… and I love me a good monster movie…, ‘Time Cop’ was a solid Sci-Fi action flick and who could forget Jack Tripper and Mindy McConnell in that classic of wacky comedy called ‘Stay Tuned’? Actually you would be surprised how many people have forgotten that movie, but not me baby. Then my main man Peter Hyams helmed a movie a couple of years ago called ‘A Sound of Thunder’. A Sound of Thunder unfortunately falls into that rare category of ‘so bad it’s good’ because it was absolutely terrible but lord knows I couldn’t have turned it off if I tried. And I did try. Now we have Mr. Hyams doing the thriller thing again with his courtroom drama ‘Beyond a Reasonable Doubt’, a remake of movie of the same name made some fifty years prior. It’s looking like I might have to track down the original because this movie right here is so absolutely ridiculously silly that it almost has to be experienced to be believed, and I am curious to know how faithful Hyams was to the original. All that being said it is clear that Peter Hyams knows my movie sweet spot because I still couldn’t turn away from this movie despite the fact it was terribly silly and I was calling out its plot points ten minutes before they occurred. Jesse Metcalfe assumes the role of fluff Louisiana TV reporter C.J. Nicholas who desires to broadcast the ‘hard stories’. For whatever reason, in his spare time C.J. likes to hang out and watch this realities version of a District Attorney in Mark Hunter (Michael Douglas) prosecute minorities, which he has been doing at a startlingly successful rate, which is also paving Hunter’s way to the governorship. You would think C.J. is hanging out at these courts to push up on the rather impressive set of hips possessed by Hunter’s pretty assistant D.A. Ella Crystal (Amber Tamblyn), which he does do and does successfully, but C.J. has other plans. C.J. thinks that D.A. Hunter is planting evidence on these cases of his but he has no proof, but he is going to get this proof, and he has a plan. C.J.’s plan, plotted along side his best friend / co-worker / and dead meat nominee Corey (Joel David Moore), is to frame himself for murder, plant the circumstantial evidence, record that the evidence was planted after the murder and await for D.A. Hunter to plant some randomly collected DNA evidence after the fact. It is one hell of a convoluted plan, and yeah, it’s a pretty crazy plan, but we’re just gonna roll with it. Sure enough some prostitute gets murdered and C.J. implicates himself in the murder but when it comes time to expose Hunter during the trial as the dirty D.A. that we all know that he is, something horrible goes wrong and its looking like C.J. might be sucking a needle for something he didn’t do. Now it’s up to his girlfriend to help C.J. from the outside and expose her beloved boss and mentor, and hopefully avoid taking a dirt nap like everybody else who seems to try to help C.J. I recently saw a movie called ‘Wrong Turn at Tahoe’ which I praised for keeping its story very simple and moving forward. While we recognize that ‘Beyond a Reasonable Doubt’ is one of these twisty thriller types and keeping it simple really isn’t an option, all of the twists were so blatantly foreshadowed and so easy to guess, that they were all rendered almost completely inert. Seriously, you will have a more difficult time attempting to figure out your average ‘Matlock’ episode than what’s presented in this movie. But pushing all the twistiness to the side and simply attempting to swallow C.J.’s original plan for framing himself for murder is also difficult to accept because it is such a silly plan. You watch the movie thinking ‘how in the hell is this going to work?’ Well, Peter Hyams is a good enough director that he does manage to make this silly plan look somewhat plausible, but when the plan blows up all is lost. Note to people out there whose lives depend on DVD backups… blank DVD’s cost about a quarter. Make more than one. But again it all comes down to the twist, but considering that early on it was almost is if someone was standing it front of the screen waving their arms pointing at stuff saying ‘Pay attention to this! There will be at test on this later!’… not much of a twist. Then there’s the Michael Douglas factor. Who is more awesome the Michael Douglas? However, truth be told, they could’ve gotten anybody to show up in those three or four scenes… say like Eric Roberts… and saved a WHOLE lot of money. Plus E-Rob would’ve put a helluva lot more effort into it. Metcalfe, Tamblyn and Moore were fine, and Orlando Jones makes a glorified cameo as one of those characters who is introduced for the sole reason of showing up just in time to do something, but anybody could’ve done what Gordon Gekko did in this movie. Was John Larroquette busy? He’s from Louisiana and would’ve been perfect in those three scenes. Still… Peter Hyams knows how pace a movie and as a cinematographer he sure does know how to stylize a pretty picture, and he always has. In addition, as completely ridiculous as this movie is and even though it failed miserably at what I’m thinking the filmmakers set out to do, that is if what they were trying to do was create a ‘keep you guessing type mystery’, it was still very watchable and kind of entertaining in its own special way. 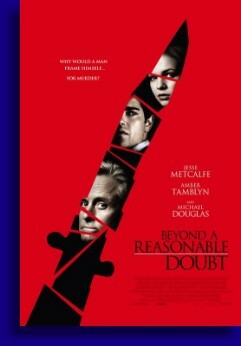 ‘Beyond a Reasonable Doubt’ is flawed, almost beyond repair, but if you keep your expectations low and don’t think about what’s going on in front of you too hard, you might have a good time with this movie.